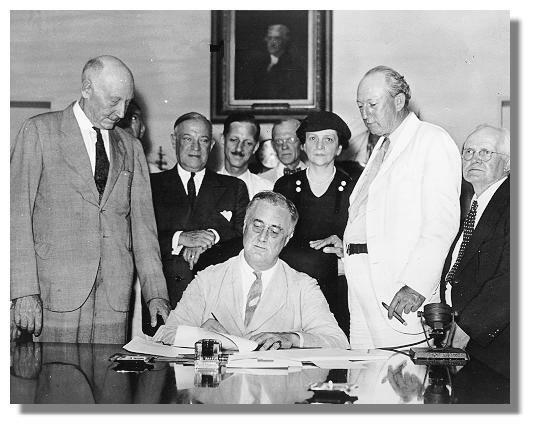 This week marks the 80th anniversary of FDR’s decree. It remained the law of the land for more than four decades. Only on Dec. 31, 1974, was it finally repealed by President Nixon. For the purposes of this regulation, the term ‘‘hoarding’’ means the withdrawal and withholding of gold coin, gold bullion or gold certificates from the recognized and customary channels of trade. The term ‘‘person’’ means any individual, partnership, association or corporation. Until otherwise ordered any person becoming the owner of any gold coin, gold bullion, or gold certificates after April 28, 1933, shall, within three days after receipt thereof, deliver the same in the manner prescribed in Section 2; unless such gold coin, gold bullion or gold certificates are held for any of the purposes specified in paragraphs (a), (b), or (c) of Section 2; or unless such gold coin or gold bullion is held for purposes specified in paragraph (d) of Section 2 and the person holding it is, with respect to such gold coin or bullion, a licensee or applicant for license pending action thereon. Upon receipt of gold coin, gold bullion or gold certificates delivered to it in accordance with Sections 2 or 3, the Federal Reserve Bank or member bank will pay therefor an equivalent amount of any other form of coin or currency coined or issued under the laws of the United States. The Secretary of the Treasury, out of the sum made available to the President by Section 501 of the Act of March 9, 1933, will in all proper cases pay the reasonable costs of transportation of gold coin, gold bullion or gold certificates delivered to a member bank or Federal Reserve Bank in accordance with Section 2, 3, or 5 hereof, including the cost of insurance, protection, and such other incidental costs as may be necessary, upon production of satisfactory evidence of such costs. Voucher forms for this purpose may be procured from Federal Reserve Banks. In cases where the delivery of gold coin, gold bullion or gold certificates by the owners thereof within the time set forth above will involve extraordinary hardship or difficulty, the Secretary of the Treasury may, in his discretion, extend the time within which such delivery must be made. Applications for such extensions must be made in writing under oath, addressed to the Secretary of the Treasury and filed with a Federal Reserve Bank. Each application must state the date to which the extension is desired, the amount and location of the gold coin, gold bullion and gold certificates in respect of which such application is made and the facts showing extension to be necessary to avoid extraordinary hardship or difficulty. The Secretary of the Treasury is hereby authorized and empowered to issue such further regulations as he may deem necessary to carry out the purposes of this order and to issue licenses thereunder, through such officers or agencies as he may designate, including licenses permitting the Federal Reserve Banks and member banks of the Federal Reserve System, in return for an equivalent amount of other coin, currency or credit, to deliver, earmark or hold in trust gold coin and bullion to or for persons showing the need for the same for any of the purposes specified in paragraphs (a), (c) and (d) of Section 2 of these regulations. Whoever willfully violates any provision of this Executive Order or of these regulations or of any rule, regulation or license issued thereunder may be fined not more than $10,000, or, if a natural person, may be imprisoned for not more than ten years, or both; and any officer, director, or agent of any corporation who knowingly participates in any such violation may be punished by a like fine, imprisonment, or both.